This year we’re celebrating a big milestone… 50 years in operations! 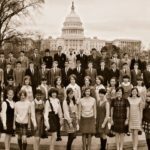 In the 1960’s, Phil Wendel and a fellow teacher at his middle school in Illinois, USA took a group of 100 students on a field trip to Washington D.C.
“When we returned from the trip, I thought that I might be able to lead this trip just as well as the tour operator that planned it for us,” Wendel said. Lakeland Tours, the tour operation that Wendel later founded in Illinois in 1967 would later move to Charlottesville, Virginia and become the largest educational travel company in the United States. After Wendel moved on from the company to focus on his next entrepreneurial venture, Jim Hall – Wendel’s nephew – led WorldStrides’ entry into international travel when he became CEO in 1994. Hall occasionally tags along on his company’s educational trips. He said he is always encouraged by the wide-eyed amazement of WorldStrides students — from middle-schoolers touring Capitol Hill to MBA candidates taking in the Great Wall of China. Over the last 20 years Worldstrides has since has moved aggressively to expand by acquiring more than two dozen educational travel companies. Today WorldStrides offers excursions to 105 countries for students of all ages, more than 400,000 students travelled with WorldStrides last year alone! The company still retains some of its employees from its early years as Lakeland Tours. They attribute the company’s success to strong leadership, some good luck and dedication to its original mission of igniting personal growth for students. Today WorldStrides employs more than 2,000 people on six continents!